"Truant Arts = mad sweet." Yes, And! is about four people who are members on a team together at an improv comedy festival. Kristen Felicetti is the editor and creator of The Bushwick Review, a collaborative literary and art zine. Her short stories have appeared in various places in print and online. She also wrote and recorded a modern radio play called The New York Crime and has played in Truant's Fast & Loose short play festival. Hey Kristen! 'Bout time you answered these interview questions! Hi Bob and Jamie! Sorry about that one, it just takes me an embarrassingly long time to write anything articulate ever. I could have sent this earlier, but it probably would have been a one-line interview that said something like, “working with Truant Arts is mad sweet!” or something equally as poetic and concise. Well, working with us is mad sweet. It is definitely mad sweet. Truant Arts = mad sweet. Truant: Let’s get down to business. Why don’t you start copy/pasting a few of those interview questions and then answer them. So, the Truants proposed this idea that you should sit in a room with a bunch of people and then generate a play. And you said yes. What were you thinking? I did say Yes. I said “Yes, and!” in fact. I generally think it’s good to step up to any creative challenge offered to you, especially if it scares you a little or you’re potentially setting yourself up for failure. However, I’d worked with Truant Arts before on a 48-hour play festival and that was a blast, so that made things a little less intimidating, knowing that the producers were going to be organized and supportive, and that whoever ended up being the actors and director were probably going to be enthusiastic and easy to work with. I wanted to work with these people and in this environment again. 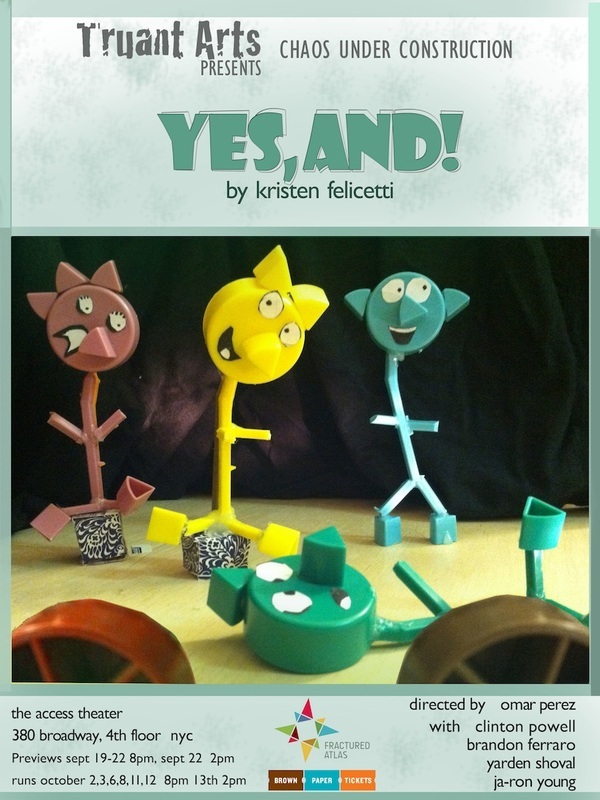 What was your process as you worked on Yes, and!? The way Chaos Under Construction worked was that several people who had not met before (a writer, a director, and several actors), met and brainstormed and got to know each other. We did some improv and exercises, with a few keywords as a jump-off point. I was really excited by my group, all the actors seemed like interesting people to write for. They were people that I’d be interested seeing acting and interacting on stage together, so that was the way in for me. I like writing directly for actors and any previous scripts I’ve written have usually been with specific people in mind to play the parts. For some reason, maybe a lack of imagination on my part since we did improv that day, it seemed like this group of people would believably be an improv team, so I went with that. I went to a bunch of improv nights at UCB. It’s fun to do research like that. Making the play about people at an improv comedy festival also helped things have a certain “liveness”. More than any narrative medium, theatre has immediacy. I know that’s an obvious point, but its one whose power should not be underestimated. If I had written a story that could have also worked as a short story or film, I would not have liked that. I wanted to create a play that would hopefully be exciting for audience to see unfold in the present. How has working with other members of your theatrical team helped you in growing the work once the first rough draft was handed out? It’s all been awesome and smooth sailing. This was going to be a collaborative process, so I wanted to bring a first draft that had malleability, both in the way it could be directed and that also gave room for actors to bring a lot of their own stuff .The director (Omar), four actors (Brandon, Clinton, Ja’ron, and Yarden) and assistant director (RJ) had lots of great opinions. In addition to being actors and directors, many of them are writers themselves. So whether it was bringing a whole fresh interpretation to a scene or helping me change a line that was grammatically wonky, it’s been a huge help. Can you see yourself seeking out opportunities to work this way in the future Why? Sure! There are some aspects of this process that I’d definitely like to do again. The previously mentioned idea of writing parts tailored for specific actors is something I’d seek again. Also just having a troupe of creative people that you work closely with on a project from beginning to end and get to laugh and have fun with along the way. The Orson Welles Mercury Theatre style of theatre troupe, or what I imagine it must have been like, really appeals to me. I like to get to know the people I’m working with, learn about the artistic things they like to make and do, and then work with them again on a future project. Why should people come see Chaos Under Construction? To see some excellent plays! Also, if you’re reading this webpage at all right now, it’s probably because you’re interested in theatre and I think this is an opportunity to see plays constructed in a unique way. Also I’m just speaking from my own perspective here, but whether it’s music or theatre or visual art, I get jazzed watching creative people who dig what they do, where you can totally feel how enthusiastic and passionate the people involve are. And I think you’ll definitely find that spirit and energy running through Yes, And! and in the four other plays. And that, folks, is mad sweet.